Recently, I was lucky enough to try some of the truffles from Moonstruck Chocolate. It was on a cold NYC morning inside Whole Foods, and I was blown away. The kind I tried wasn’t all dark chocolate, and I usually shy away from anything that may be milky or too caramel-ly. But this was great chocolate. 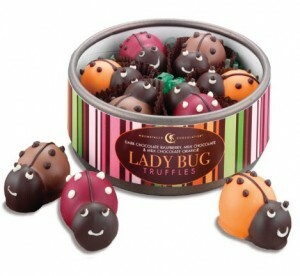 For Easter they have a collection of Ladybugs, tiny Country Critters truffles and a Vintage milk-chocolate Bunny… For the Christmas season they have very “Festivus” Ginger and Eggnog truffles, as well as an Extra-Bittersweet Holiday truffle, which is divine. But their holidays span year-round and their catalogue includes cool and funny Halloween designs, as well as lovely and romantic Valentine’s Day chocolates. Do give them a try, by clicking on the Moonstruck website. And now, this is not your childhood, innocent little chocolate bon bon! 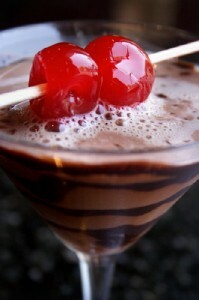 It’s a very adult, very serious Chocolate Martini, the ultimate in grown-up decadence and alcoholic fun! It has a way to warm your heart and more. Try it, what have you got to loose?! Fill two cocktail glasses with ice water; set aside. Fill a cocktail shaker with ice, add vanilla vodka, creme de cacao, and Frangelico hazelnut liqueur. Shake vigorously. Empty glasses of ice water, and dip edges into a flat dish filled with sweetened cocoa powder. Put one cherry in each glass and strain the contents of the cocktail shaker over them. This entry was posted on Thursday, December 6th, 2007 at 8:24 am and is filed under Chocolate Corner. « Things that are Festivus!